The Asus P7P55-M is a mid-range P55 motherboard sporting some of the latest features but also chops a few out to try and keep the price competitive. For anyone who's been living under a rock this last year, or perhaps ignoring any hardware news that might tempt them to spend money, the new Intel P55 Express chipset is Intel's way of benevolently letting the majority of us afford Core i7 technology. The P55 Express chipset heralds a new approach for Intel to desktop chipsets. Over the years we've become used to the northbridge/southbridge double act, a Memory Hub Controller backed up with a slightly dumber, but equally essential ICH South Bridge. As the Lynnfield processor contains all of the logic required for the DDR3 dual-channel memory controller, plus a 16- lane PCI-e controller, the P55 is demoted to being a glorified southbridge chipset. Handling the meat and potatoes of the I/O world, with up to 14 USB 2.0 ports, six SATA 3.0Gb/s ports, networking and up to another eightlanes of PCI-e to be dolled out. This means the thing that can differentiate one board from another is just how and what features each manufacturer decides it's going to implement. For this board Asus has opted for a single x16 slot, so any spare graphics card is going to have to find another home. There are other options for the PCI-e split, such as twin eight lane x16 slots or even adding a third four-lane x16 slot. The lack of legacy ports supplied by the P55 can be seen as a good thing but no PATA channels means ASUS has to add a VIA controller so we can still use our PATA optical drives. It's opted for eight fixed back-plate USB ports with a single FireWire and Gigabit LAN, but no eSATA. Six more USB ports can be added via onboard headers, while there are six onboard SATA 3.0Gb ports. Memory support offers dual-channel DDR3 from four DIMMs, which can be populated with up to 16GB of memory. 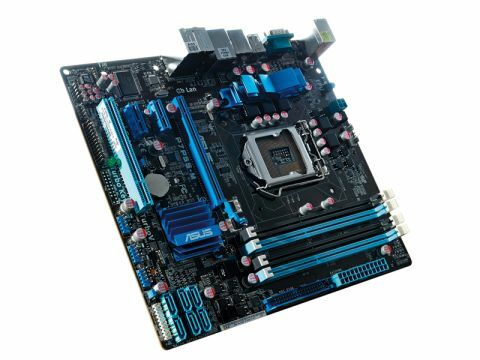 This AsusS board has good overclocking support for speeds up to 2200MHz. Oddly its DIMM slots only use a single securing tab but this seems to work well enough. Despite putting in good memory throughput of 16.42GB/s the gaming performance was for some reasons behind that of the MSI board and the other systems on test, scoring 15,387 in 3DMark06. This result was played out to a lesser degree with the other benchmarks in the suite. An x264 encoding score of 65.05fps was just under two frames behind the MSI P55M-GD45, while the Cinebench score of 13,419 lagged by about 600 points. A key advantage not instantly apparent is the power draw of the Core i5 architecture. Idle it runs at 111W verses the AMD's 154W, while under full load it's 179W against the AMD's much higher 226W. Using the supplied Turbo V overclocking tool we were a little disappointed by the lack of overclocking the board demonstrated. Managing to take the FSB from 133MHz up to a stable 149MHz. Despite this the board is equipped with a full selection of overclocking tools with the BIOS. But considering its basic features and lacklustre performance it's hard to recommend over some others out there.